When Adwoa Asare was 22, she lived for a year in an intentional Christian community where residents needed to be uncommonly honest, even when it wasn’t easy. To harbor mounting grudges for months on end wasn’t an option -- at least not a good one -- for the eight Episcopal Service Corps (ESC) volunteers living under one roof. Together they figured out strategies: They wrote a two-page rule of life that established expectations, then revised it over time. They created safe zones for “messy” conversations, where anyone could get permission to speak bluntly or awkwardly and be received with grace. It wasn’t perfect, but generally the issues got worked out in a setting that felt comfortable and candid. Adwoa Asare signing the Rule of Life, the household covenant for her group, in the presence of Susan Gladin, the program director, and community members. Each participant signed the agreement. As an expression of the New Monasticism, or living together under a rule of faith, ESC is striking a chord. Its ranks are swelling at a time when young adults are increasingly disconnected from religious life and when other, secular volunteer service programs are losing some of their appeal. The nonprofit ESC’s network of programs across the country has grown from six programs and 46 participants in 2008 to 30 programs and 200 participants this year. Applications have risen by more than 50 percent since 2010. Can you imagine ways to convene young adults who share passion for social justice and nonprofit work? In ESC, observers see an effective, replicable model for shaping faith leaders to be resilient over the long term. It’s no panacea; the structured-yet-adaptable framework carries risks that some groups manage more fruitfully than others. But in the process, observers see future leaders becoming more honest, convicted, disciplined and battle-tested. Open to adults 21 to 30 with college backgrounds, an ESC experience has five core elements: service work, living in intentional community, relationship with an Episcopal community, theological reflection and a simple lifestyle. The current network took shape in 2008 with six programs, building on the experience of earlier groups formed in the 1980s and ’90s. It is informed by older programs as well, including the Lutheran Volunteer Corps and the Jesuit Volunteer Corps. Each participant serves in a justice-focused setting, such as a farm, homeless shelter, school or parish. 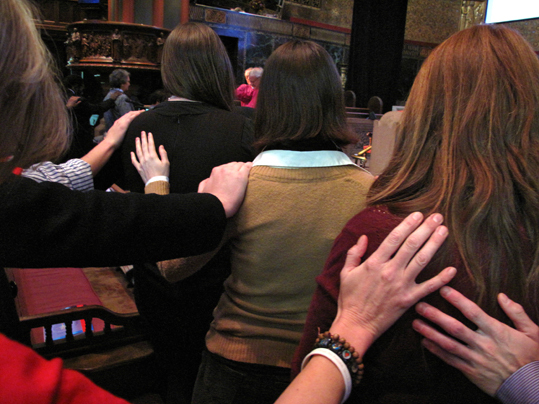 Participants gather regularly for meals and a shared spiritual practice, such as prayer. They spend time in directed theological reflection; they often read the same books and discuss them. Together they come up with a rule-of-life code governing how they’ll live together for nine to 11 1/2 months. “A year of service in this model is very intense,” said ESC Executive Director Amity Carrubba. “It usually takes someone, an alum, about three years before they’re really starting to synthesize, integrate and understand the impact of their year of service on their life.” The formative power of young adult service years is widely appreciated in mainline Protestant circles, especially as denominations strive to stem the millennial migration away from religious institutions. Participants in the ESC-Maryland program at a retreat. 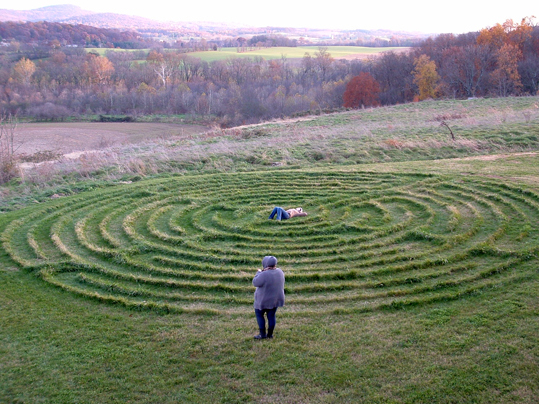 Each site establishes its own expectations, including spiritual practices. Among Americans ages 19 to 34, more than 35 percent claim no religious affiliation, according to a Pew Research Center survey released in May. That’s double the unaffiliated rate for baby boomers. Yet hundreds of young adults with leadership potential stay connected to religious life through service-year programs run by Lutherans, Methodists, Presbyterians and the United Church of Christ, which have kept the torch burning despite tight budgets and cuts in other mission areas. Because these programs compel young adults like few other church offerings, Presbyterian seminaries are currently preparing a campaign to pick the brains of service program leaders and participants for key insights. But as an improving economy generates more options for recent college graduates, the service year concept is becoming a tougher sell. AmeriCorps, the Peace Corps and Teach For America have all seen application numbers fall in recent years. And yearly application figures are generally plateauing for the 18 faith-based service organizations that receive support from the Forum for Theological Exploration, according to Chris McCain, FTE’s director of strategic partnerships. Against this backdrop, ESC programs shine as promising exceptions. ESC’s Life Together in Boston, for example, drew 170 applications in 2014, up from 97 in 2009, when the Great Recession economy was in shambles. Now in its 16th year, Life Together was one of the original six programs that came together to form ESC in 2008. The ESC funding structure has facilitated its swift expansion. Money comes largely from partner agencies that pay $16,000 to $25,000 for each ESC volunteer who serves at their sites. (Participants get a small stipend from ESC, around $200 per month.) In return, agencies get about four days’ work per week from each sponsored volunteer. This potentially costs less than hiring an employee for the same number of hours. Adding new partners (i.e., funders) can be relatively easy when the arrangement helps a partner agency’s bottom line. These partner-based funding streams allow ESC to avoid certain challenges found in other models. The Presbyterian Church (USA)’s Young Adult Volunteers (YAV) program, for example, depends on the denomination for most of its funding, $2 million per year ($22,000 per volunteer). The PCUSA also expects participants to raise $3,000 each. Participants work with a variety of nonprofits and agencies. This model has advantages: denominational support keeps standards uniform and signals churchwide support, and the fundraising requirement establishes a broad stake in each volunteer’s work for the year. Both are important pillars for sustaining the character of the program, according to YAV coordinator Richard Williams. But the funding structure also makes it hard to scale up, Williams said. 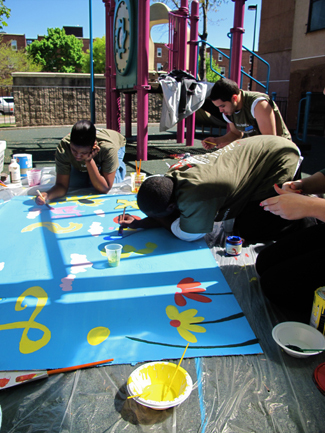 The YAV program has a goal to enroll 180 volunteers by 2016, but it’s only halfway there. The PC(USA) has cut its participant fundraising requirement by 50 percent since 2013, and it began soliciting individual donations to the program this year. Others could potentially adopt the lean ESC model, which requires no volunteer fundraising, no centralized church funding and no top-down denominational management. Can you identify organizations with which you could establish mutually beneficial partnerships? ESC is not an arm of the Episcopal Church but rather an independent nonprofit with ties to many Episcopal institutions, from congregations to dioceses and charities. ESC has scaled up in recent years with grants from the General Convention of the Episcopal Church and more than $1 million from Trinity Wall Street, a New York City parish, but that money was targeted to seed growth and isn’t seen as essential to ESC’s sustainability. With the flexibility that comes with decentralization, ESC has carved a distinct niche marked by diversity across program sites, ranging from a monastery in Cambridge, Massachusetts, to a California organic farm to an eco-friendly retreat center in Waialua, Hawaii. Prayer, theological reflection, reading and shared meals are often components of the ESC year. Participants need not be Episcopalian or even Christian. A full 29 percent of ESC participants claim no religious affiliation, are non-Christians or have a religious status unknown to ESC, according to the group's survey data. A few non-Christians have been baptized, Carrubba said, noting that the programs can be evangelistic. ESC is also the most racially diverse of the 18 FTE-supported organizations; one of every four ESC participants is nonwhite. ESC members enjoy substantial latitude to craft the experience and solve problems. No program director rushes in with a formula to save them from, say, protracted household conflict. Participants have to make their own road maps to living simply, faithfully and harmoniously in community, and that’s where leadership skills get fine-tuned. The process can be difficult. Twenty-three-year-old Cate Anthony spent the past year living in a Julian house in Chicago, where six housemates at first pledged to share three meals a week and pray together once a week. Those commitments fell by the wayside as conflict festered, and one person was asked to leave. But Anthony regards the experience in hindsight as a blessing nonetheless. On pensive bus rides home from her hospital chaplaincy work and in weekly theological reflection with the program director, Anthony discerned God’s call to become a lay chaplain -- and to expand her conflict-management skills. Although she had long planned to become an Episcopal priest, she discerned that she doesn’t want the ordained, priest-in-a-fishbowl life. And after this tough year, she knows she can and must serve God in other ways. Challenges of a different type unfolded at the house where Asare lived two-to-a-room with seven others. 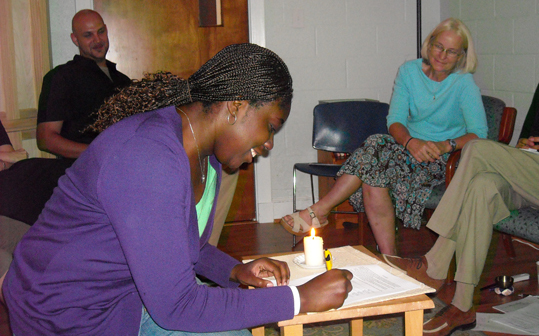 The program, called Johnson Service Corps (JSC), is centered on the “servant leadership values of communion, compassion, co-creation, collaboration and character.” One aspect of the experience is weekly servant leadership training sessions, which involves group discernment and a "praxis project." At their house in Carrboro, North Carolina, the ESC participants agreed early on that alcohol and overnight guests would be permitted, but they later added restrictions, to ensure that everyone felt respected. For instance, using the house purse to buy booze came to be forbidden by a vote of the community, as did hosting a guest overnight without giving the household advance notice. “Setting up group norms in the beginning gives everyone something to agree on, saying, ‘I want this to be a healthy environment where I feel comfortable,’” said Asare, who now works at Habitat for Humanity, where she supervises a JSC volunteer. She learned that agreeing on norms upfront, and then interpreting them as needed, helps resolve issues without charged emotions, drama or personal assaults. Whenever a rule is violated, one can always turn to the rule and not focus on the traits or habits of the violator. Using this principle, she now urges co-workers and church group members to be explicit about their expectations and to speak up when agreed-upon protocols get neglected. Asare ranks among many ESC alumni who are still involved in church and justice work in some capacity years later. More than half of Johnson Service Corps alums work in ministry (lay or ordained) or in nonprofit social services. Seventy-one percent of Life Together alums are involved in some type of volunteer work, while 30 percent go on to ordained ministry. The Rev. Jason Emerson, among those ESC alumni who pursued the path to ordination, finds grace in habits that trace directly to his experience at Resurrection House in Omaha, which became a part of ESC. In 2001-02, he learned to honor the Sabbath by taking a day off each week to rest, think and recharge. Now, despite myriad pastoral duties in his role as rector of Omaha’s Church of the Resurrection, he vigilantly guards his Sabbath Monday. He routinely uses it to clean his house, which he said brings peace to his home and family life. As current director of the Resurrection House program, he encourages each year’s volunteers to honor their Sabbaths, too. For all their varied experiences, ESC members and alums find they have each been shaped by a process that leaves it up to them and their groups to develop what’s needed in order to do well. The experience seems to encourage trust in God’s providence, perhaps because so much of what they receive lies beyond their control. Are there aspects of the Episcopal Service Corps that you might adapt for your context? Can you imagine ways to convene young adults who share passion for social justice and nonprofit work? ESC groups each have a unique character. Are you willing to allow your initiatives to differ from one another, or are you more comfortable with a common template for programs or activities? Young adults participating in ESC learn leadership skills by working out issues in their households. Would that kind of “on the ground” leadership training work in your ministry? Cate Anthony discerned what she needed to from her ESC year, even though it wasn’t what she expected. How can you help people in your organization learn from unexpected or even unpleasant experiences? The partnership funding model has helped ESC become sustainable. Can you identify organizations with which you could establish mutually beneficial partnerships?